The Governor is built on what S&W calls a Z frame which is basically a stretched out N frame. This revolver has a 6 shot capability and the ability to shot a mix variety of calibers in each 6 shots. For example, one could load 2 rounds of .410 and 4 rounds of 45 Long Colt and fire all 6 without any issues. Loading and shooting the .45 ACP rounds requires a moon clip (which is basically a small metal ring that is designed to hold a number of rounds together to be loaded all at one time instead of loading them one by one. The moon clip is required for the 45 ACP rounds as those cartridges do not have a rim like the .410 shells and the .45 Long Colt. Each Governor ships with 5 45 ACP moon clips in various round configurations. The Governor frame is made from either a scandium alloy or lightweight stainless steel, making the revolver very light (29.6 ounces unloaded) for its size. Like most S&W revolvers, the Governor is a single action/double action model that can be fired in either single action or double action mode. Current Governor models are equipped with a 2.75” barrel. #1 – Since the Governor and the Taurus Judge are basically the same, will a Governor model fit into a holster made for the Taurus Judge? 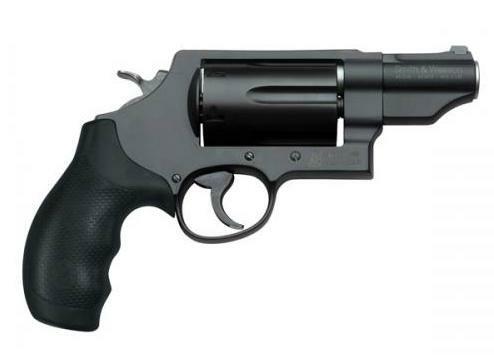 Although the Taurus Judge and the S&W Governor do look similar, they actually have very different dimensions. The standard Judge has a 3” barrel compared to the 2.75” barrel on the Governor, and the Judge is 1.5” wide while the Governor is slightly thinner. Because of these frame differences, the Governor won’t fit into a holster made for the Judge and vice-versa. #2 – I have the Governor model with Crimson Trace grips. Do you have any holsters to fit it? Yes, we can help. Any holster listed below is available in version to fit the S&W Governor with a Crimson Trace grip. #3 – Can you recommend a good IWB holster for the Governor? Our most popular IWB model for the Governor is the MTR Custom Adversary Clip-On IWB. #4 – I know that the holsters on this page are supposed to fit the S&W Governor, but I don’t see a Governor pictured in any of these holsters? All of these holsters seem to be made to fit semi-automatics? The pictures you see below for each holster are just sample pictures for demonstration purposes, and were taken with whatever pistol or revolver model that we happened to have on hand at that time for demonstration pictures. It’s very difficult (if not impossible) to take a picture of every holster that we carry made for the S&W Governor in every shooting hand and color combination. Any of the gun holster models listed below are available in a version to fit the S&W Governor with a 2.75” barrel.